Alex doesn't really have time to watch the news. Between school, his part-time job, the debate team, and keeping his grades up so he can get a scholarship to Georgetown, Alex is kept pretty busy. So when the asteroid hits the moon, Alex doesn't immediately know the danger he's in. He figures it'll take NASA a few days to figure out how to move it back and then life will go on as normal. Sure, it's a bit disconcerting being in charge of his two younger sisters while Papi is in Puerto Rico attending a family funeral, older brother Carlos is deployed with the Marines, and Mami is unable to leave her job at the hospital due to the catastrophe. But they'll be home as soon as they can, Uncle Jimmy has made sure they have plenty of food, and Alex is sure this will all blow over. This sequel to Life as We Knew It explores the apocalypse through the eyes of a Puerto Rican teenager in New York City. Left alone without his older brother or parents, Alex has to figure out how to feed and protect his two younger sisters. Briana is devout, turning to her faith when all else seems grim. She staunchly holds on to the belief that her parents will return someday. Julie is the baby of the family and she acts that way. She and Alex have always butted heads and now she'll be forced to grow up and deal with the situation they're in. I loved Life as We Knew It and I thought it was really interesting to see the same event through another character in another place. Alex deals with some of the same problems as Miranda in LAWKI, but he also deals with some very different ones. Alex lives in a major city, so he's able to partake of some social services. He gets lunch at his school, he can pick up bags of food being given out every Friday. But at the same time, these very services cause other problems. There are food riots and epidemics of cholera and influenza. The whole borough of Queens is evacuated, and Alex has heard horror stories about the evacuation stations. Another interesting difference was the teens' reliance on their faith. Alex and his sisters are all Catholic and they turn to the Church for help. Their Catholic schools feed them, their priest helps Alex look for his father. Although Alex doesn't have his parents to rely on, he comes to rely on the Church family. And he comes to rely on himself, doing whatever is necessary (as distasteful as it may be) to feed his sisters and keep them safe. All the things you've heard about td&tg being a lot darker than LAWKI are true. LAWKI was seriously ominous, but it seems cheerful compared to this book. There are more graphic scenes in td&tg, too. Bodies are rotting in the streets, people die in front of your eyes... Sensitive readers beware. Also, I highly recommend reading LAWKI before you pick up td&tg. LAWKI really builds the event and presents a lot of information about it, while td&tg drops you right into the action. Knowing from Miranda's account how bad things were going to get really helped build the suspense for me as Alex was stumbling around not reading the newspaper. When I read LAWKI, I found myself hunting in the pantry for a bag of chocolate chips, ripping the bag open and eating a handful. As I read td&tg I put on more and more articles of clothing until I finished the book and realized I was wearing two pairs of socks and a huge hoodie. Mad props go out to Jen Robinson who posted on her blog that the book was already in stores. I did not hesitate to run right out to Barnes & Noble and pick up my copy. You'll want to check out her review of td&tg as well. 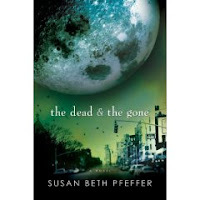 Also check out the review at bookshelves of doom, an interview with Susan Beth Pfeffer at Cynsations, and (of course) Pfeffer's own blog. Glad you enjoyed it, Abby! I had my post all ready to go on June 1st, the official publication date, but when I saw on the author's blog that it was available, I figured people would want to know right away. And boy, did you get it read and reviewed quickly!! I completely agree with you about this: "Knowing from Miranda's account how bad things were going to get really helped build the suspense for me as Alex was stumbling around not reading the newspaper." That added a whole extra level of tension to this book. I wasn't crazy about LAWKI, but that was mostly because I found Miranda irritating. Even so, I'm tempted to give the sequel a shot -- new characters and all. Do you think there's a decent chance I'd like installment #2 better? I totally think you should give td&tg a shot... It's been awhile since I read LAWKI, but from what I remember Alex seems to be kind of the anti-Miranda... He's constantly thinking about others and how he can protect his sisters. He even has to be reminded to think about his own survival because he's so bent on saving his family members. Hot dog -- I'm in! Oh, Abby. This was not a good book. I shall argue this point with you on the morrow.